Way back in the 70s, before I started writing, I was an art teacher in the San Jose Unified School District in California. 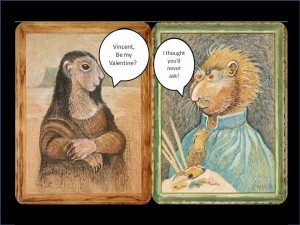 To draw these large portraits I used oil pastels to render Mona Lisa and Vincent Van Gogh as groundhogs. I framed them and they’ve been hanging in my garage all these years. The reason for making them in the first place was to use as fun decorations for our pot-luck party that just happened to be on Groundhog Day. Recently, I photographed the couple, and my daughter, who is computer savvy, flipped Mona around to face Vincent, because for almost 40 years they’ve both been been facing left. They couldn’t even see each other though they knew they were both famous…after they died. Now, they’re face to face and finally getting acquainted. My daughter also added the balloons for captions so we can eavesdrop on their conversations. I’m sharing them here for two reasons: to show off my good taste in fine art and to wish you all a Happy Valentine’s Day. Very clever, but I think you should have shown Van Gogh’s sawed off ear. Oscar, this was only one of his self portraits. I’ve seen the painting he did of his ear all bandaged and that would be a fun one to copy. a third one! Who would it be? Renee, I’d like to use Grant Wood’s “American Gothic” for something. Remember that he was Nana’s junior high art teacher in Cedar Rapids.